(《複数形》 音節ret・i・nas，ret・i・nae 発音記号・読み方/‐nìː/) 【解剖】 (目の)網膜. a topical preparation of tretinoin that is used to treat acne. tretinoin is a form of vitamin a. 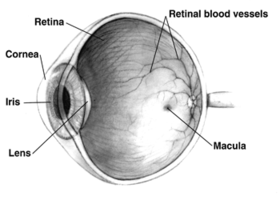 Illustration showing parts of the human eye, including the retina. From Medieval Latin retina, the diminutive form of Latin rete (“net”), probably from the Vulgar Latin phrase (tunica) *retina, literally "net-like tunic", used to describe the blood vessel system at the back of the eye. (Gerard of Cremona may have created this phrase as a translation for Arabic (ṭabaqa) shabakiyya "net-like layer", which translates Ancient Greek ἀμφιβληστροειδής (amphiblēstroeidḗs) (χιτών (khitṓn))). (anatomy) The thin layer of cells at the back of the eyeball where light is converted into neural signals sent to the brain. An abbreviation of the Classical retināculum n, which, because it occurred almost exclusively in the plural (retinācula, -ōrum), was reinterpreted in its abbreviated form as a feminine, rather than a neuter, noun. An etymologising spelling, closer to the word’s etymon, the Ancient Greek ῥητῑ́νη (rhētī́nē).